Montgomery County Hospital District Medic 45 crew Vivian Lam and Andy Adams of the loaner boards at Lake Conroe Park on TX-105. Local officials are urging the public to educate themselves on water laws and to keep life jackets readily accessible while celebrating on Lake Conroe. Precinct 1 Constables and Conroe Fire Department will be on the lake this Fourth of July for quick response and extra coverage for lake incidents. On busy weekends the Montgomery County Hospital District staffs a paramedic on the boat with the Precinct 1 Constable’s Office to help respond to possible medical emergencies on the lake. Constable Precinct 1 Marine Division Lt. Timothy Cade also reminds boaters to visit the Texas Park and Wildlife website for safety tips and state laws while boating and to be courteous to others on the busy water. Cade said there are not many holiday weekends that go by without an accident. One often forgotten law that can help prevent an incident is to keep in neutral at an idle speed within 100 ft of an object, he said. Another pointer: “Alcohol and water do not mix,” according to Cade who encourages boaters to have a designated driver. “It just takes one person with a bad idea (for an accident to happen),” he said. Boating related injuries are one of the biggest problems in Montgomery County, according to Ashton Herrington of the the MCHD. Herrington and Cade emphasize keeping the life jacket in a place it can easily be reached in the case of an emergency. “Even being the best swimmer doesn’t keep you from being a victim of drowning (including if knocked unconscious),” she added. 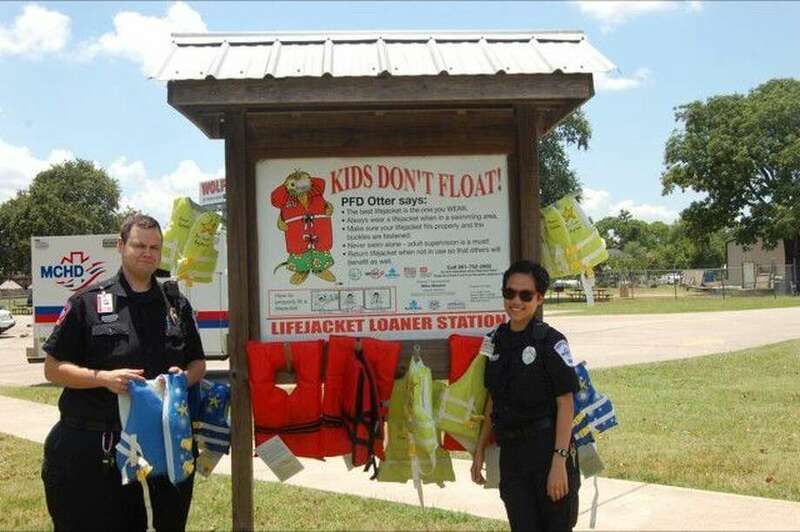 To help, two life jacket loaner boards with approximately 40 Coast Guard approved jackets are available at the Lake Conroe Park on TX-105. One is located near a bathroom facility on the east side, the other is further north west. Herrington said Texas law requires anyone under the age of 13 on a boat that is not docked to wear a life jacket at all times. “The goal is to return it for the next swimmer,” Herrington said. In 2014, two women and a child were killed when a bass boat driven by Andrew Faterowski, also occupied by country music artist Josh Ward, struck a pleasure boat carrying the family. After a total of four deaths that year, Lake Conroe was ranked deadliest in Texas for most boat-related deaths since 2000. In 2015, Lake Conroe ranked third. However, there had not been a boat-related fatality since then until Michael Wayne Conaway of Magnolia, 58, collided with another fishing boat during tournament in February 2016. This year, Montgomery County has already had 12 drowning-related incidents and of those 12, eight were children under the age of 18. While not all are related to the lake, Herrington reminds parents to be aware of surroundings and to keep an eye on children near the water even at home. “Drowning is one of the leading causes of death inchildren ages one to four,” she said.